Browse: Home / Is The Hague making a mockery of justice so the CIA and MI6 can save face? Ben Emmerson, who is Senussi’s UK counsel – and, by chance, the UN’s special rapporteur on counter-terrorism and human rights – has described this month’s pre-trial decision by the International Court to refuse to try Senussi in The Hague as “shocking and inexplicable” because there is “overwhelming evidence… that the Libyan justice system is in a state of total collapse and that it is incapable of conducting fair trials”. While making no assumptions about the reasons for the pre-trial hearing’s decision, Mr Emmerson told The Independent that when lawyers for Senussi demanded to know if MI6 operatives had interrogated him during his stay in Mauretania – and before his illegal rendition to Libya – Foreign Secretary William Hague declined to reply. 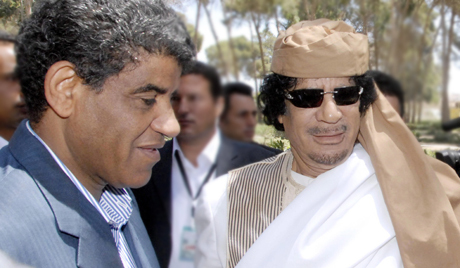 Senussi was deported to Libya, according to several Libyan parliamentarians, after the Mauretanians received a bribe of $200m; the state should have handed him over to The Hague tribunal. And since Senussi has been held in Tripoli, Mr Emmerson and the defendant’s other lawyers have been refused permission to see him. Senussi’s 20-year-old daughter, Anoud, has described to The Independent how she saw her father in prison in Libya “apparently beaten on the eyes and nose, very weak and weighing less than 35 kilos”. After arriving in Libya in late 2012, Ms Senussi was imprisoned on charges of using a false passport, but on her release last month, she was kidnapped on her way to the airport “for her own protection” by armed men. Freed unharmed later in the same week, she said she was not sure who had abducted her – but reports suggested one group of Libyan policemen had kidnapped her from other Libyan security men. “When I saw my father, I was not allowed to be alone with him and I couldn’t talk to him out of earshot,” she said. “He had been threatened he would be hurt if he spoke about his treatment. There will not be a safe court for my father in Libya with the present government – which is powerless to do anything.” Ms Senussi is now living in Cairo. No one doubts that Senussi is a man who holds many secrets – nor that he had a reputation as one of Muammar Gaddafi’s fiercest and most loyal henchmen. He is wanted for crimes against humanity, and there is no doubt that the torture of Libyan exiles – after their rendition to Libya with the help of MI6 and other Western security agencies after Tony Blair’s “deal in the desert” with Gaddafi – fell under his remit. Senussi was, in effect, the receiving end of the renditions and of the information about Libyan exiles furnished by the West to Gaddafi. Human rights activists regard Senussi as the black box recorder of the secret liaison between MI6, the CIA and Gaddafi’s security regime. And the longer Senussi remains imprisoned and incommunicado in Libya, banned from meeting his international lawyers, unable to speak freely even to his own daughter and liable to face a fraudulent Libyan “trial” – always supposing it takes place – the secrets of MI6 and the CIA are likely to remain safe. An open trial at The Hague could reveal the full and scandalous relationship between Gaddafi’s thugs and British and American intelligence agencies. He had been detained for 14 months in Libya “without access to any lawyer despite his repeated requests to see a lawyer”. Human rights groups suspect that the ICC, anxious to maintain its prestige after criticism from African states that it is concentrating only on African defendants, is also fearful that if it appeals to the UN Security Council – of which the US is a voting member – to have Senussi’s trial held in The Hague, it may be rebuffed. A notice of appeal has been lodged by Mr Emmerson and his colleagues at The Hague to prevent domestic proceedings continuing in Libya. Senussi is widely believed by Libyans to have been responsible for the 1996 massacre of more than a thousand prisoners at the Abu Salim jail, and he has been convicted in absentia in France for his alleged role in the 1989 bombing of a French UTA passenger airliner in which 170 people were killed. Senussi married the sister of Gaddafi’s wife. During the 2011 insurrection in which Gaddafi was himself murdered by rebels, Senussi was blamed for the deaths of regime opponents in Benghazi.